Nicole Kidman on the Red Carpet. She is an A Lister and sells magazines. In fact most celebrity photographers will show up to photograph a women over a man any day of the week. Nowadays photographers use technology to get their photos out to their agencys so they can be shopped. Competition is fierce, but I am too lazy to carry my laptop on an assignment. So I may not get my photo pick up as much as the next person. 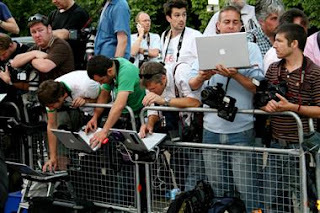 Being a paparazzi isn't just about getting a good shot, its about being prepared, patient and willing to kick it up to the next level to get the shot to the public in a timely fashion. Last week I didn't asked to be credentialed at this Louis Vuitton event as I wanted to shoot an event earlier in the evening. It was a guy, a very popular guy, but because he doesn't sell magazines like the women, I was the only photographer there. And sadly as my pap friends told me, no one would be interested in the shot as there was a big fashion event going on in the City the same night. I went to that too and still got a decent shot of Scarlett Johanssen, variations of this shot sold. Most were full fashion length. Scarlett was paid $100ks just to walk the Red Carpet at Louis Vuitton as they knew they could get the press to promote their store opening if they had a high caliber celebrity show up. Poor Scarlett has a tan line. What was she thinking? Hello cover up make up anyone?